Teachers getting free candy from students for Teacher Appreciation week. Teachers are one of the most essential factors in society, and once a year at the start of May, people gather to celebrate their hard work during Teacher Appreciation Week. The purpose of these seven days is to encourage students to show their appreciation towards their teachers’ endless hard work through little gifts, letters or even actions. 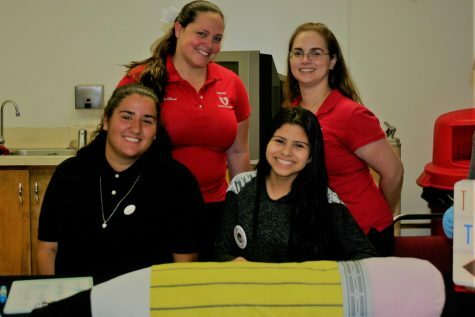 Students involved in the Teaching Academy and Future Educators of America (FEA) managed to organize different activities every day during the week of May 7-11 on behalf of all Gables students this year to honor the teachers at Gables. “Teacher appreciation week is a great way of getting teachers to know that we actually do feel for them. We know that they have their own lives outside of school other than teaching and we appreciate what they do here for us,” sophomore Sheyla Hernandez said. The F.E.A sponsors and two of their students posing for a picture. On Monday, FEA gave out brownies to every teacher in the school; a treat sponsored by Mrs. Torres and Santamaria, the teacher sponsors of the club. The following day, Little Caesar’s donated pizzas and on Wednesday cupcakes were delivered to each classroom. 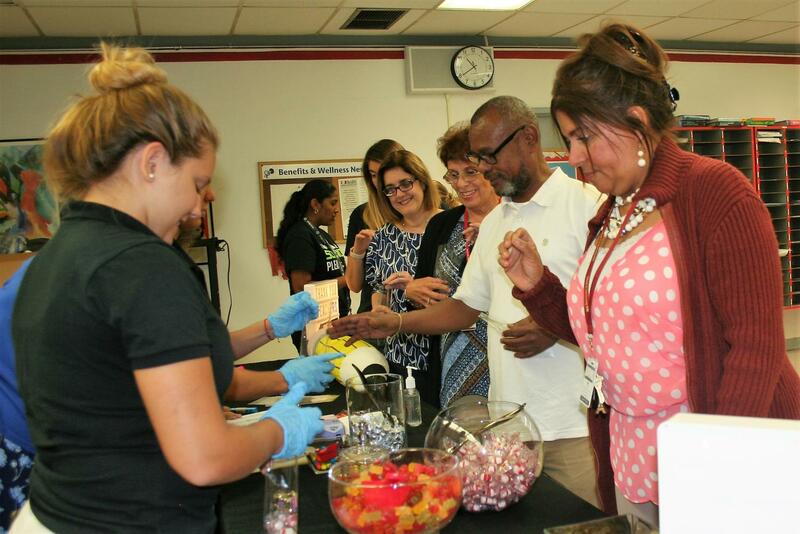 On Thursday, teachers lined up in the lounge to fill up bags with candy. Lastly, on Friday during first block, pastelitos where delivered to teachers by FEA students. Since the Teaching Academy and FEA are programs that have been just recently added to Gables at the beginning of the year, it was the first time that something like this was done at the school. “I love Teacher Appreciation Week. I love that I get to help out and give our amazing teachers something special to celebrate Ms. Torres and Santamaria, who really contribute to The Academy and F.E.A, and to all teachers who work here,” sophomore Keila Aguila said. In addition, companies outside the school contributed to give teachers something that they will be able to enjoy, such as Giardino Gourmet Salad who offered a free meal to every teacher who works at the school, as well as Lokal Burger and Beer who had happy hour for teachers during Thursday afternoon. While appreciation for teachers was on full display this week, students should appreciate teachers and their work and dedication to creating a better future every day.